The features may seem basic (simple music player, two-megapixel camera, GPS without maps), but they're still smarter than a lot of ruggedised phones. We love the addition of a second SIM card slot, but without 3G its versatility is limited. The screen is not that big at 2.2 inches, nor is it high res, but it remains reasonably easy to read. And the black and yellow JCB styling will mark it out as a toughphone straight away. The phone is pretty tough, surviving all the splashes, dust and drops we could throw at it. Signal pickup and call quality were reasonable but not outstanding. Several features are hidden away in odd places, which makes navigating rather tricky - and the virtual and physical keyboards are not easy to use. If you've broken more mobile phones than you care to remember, just by being downright clumsy, JCB might have the answer for you. The JCB Toughphone Pro-Talk is designed to be used in tough conditions such as building sites, or just by the careless among us. 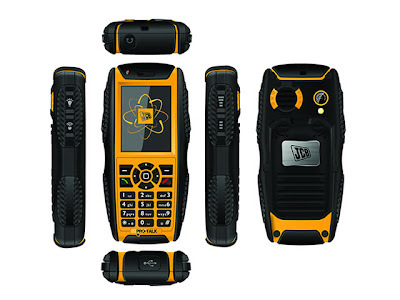 The answer comes in the shape of the JCB Toughphone Pro-Talk, which is by no means small. However, you have to bear in mind that it is in reality two handsets in one. Yes, the Pro-Talk actually has a pair of SIM card slots, which allow you to both receive and call on two different phone numbers - great if you want to keep work and private calls separately, (or indeed if you're having an affair - but we'll leave that one with you). The handset can also be programmed to have a different ringtone for each number - so you know whether to answer your phone with your ‘professional' voice or a more casual, friendly tone. It's a simple facility to use - all you do is just dial the number you want and when you press send, the phone will ask if you want to call from SIM 1 or 2. You also get to view two different signal strength meters on the display. To dial you have a choice - either use the virtual keyboard on screen, or the conventional one. We're not sure there is any benefit from this as the virtual one is not that easy to use. Indeed, the real keyboard isn't that great either - we found the keys were too small and pretty close together. Not easy if you have bigger hands. There are other touch-screen tough-phones, such as the Motorola Defy, which runs on Android and is certainly a smarter phone than this one, but it doesn't offer as much in the way of protection. Also the Pro-Talk has a resistive screen. Now, usually, we would say that a capacitive display is far more preferable, but should you be using your phone outside, and are wearing gloves, or it's raining, then a resistive screen is a far better option. When we tried texting, we found that using the miniscule onscreen QWERTY keypad was just too fiddly. We couldn't hit the key we wanted, even when using the edge of our pinkie fingernail. Another disappointment is the handwriting recognition. Write on the screen and you'll see the handset converts it to text - a great idea until you come to realise that you have to correct pretty much every word. As with most other rugged handsets, the battery compartment sits behind a door that is held in place by lugs that must be turned to undo the door. It's another thing we found rather fiddly, as if the lugs aren't in exactly the right place, it simply won't shut. Look in the menu options and you'll find Business Zone - oddly, this is where you go to access the handset's games. Mind you, there's only Magic Sushi and Tetris to choose from so we don't think you'll be heading there very often. We found the menu system to be far from intuitive - there is GPS, for example, but you'll discover it hidden away in Organiser. There is no mapping facility included so you'll just find out your latitude and longitude. The handset can also be used as a two-way radio, which is handy if you want to communicate with someone else (for free) on the building site or in another outdoor environment. We must also point out that the phone doesn't offer 3G, so if you want to surf the net you'll be using GPRS, so don't expect it to be quick. A handy feature is the wind-up charger, which means you can give it a wind to get a bit of power if your phone is flat. You need to do rather a lot of winding to get a little bit of talking, but it's useful if you're desperate. We do like the fact that you can suppress background noise - useful for noisy places such as building sites - you'll find this facility under Organiser. There is a camera on board ( two-megapixels), so it's not hugely impressive but it's good enough for taking some basic images. You can also use the flash as a torch when you're not taking pictures. JCB produced an earlier tough-phone, which was called the Tradesman. It wasn't as smart as the Pro-Talk, but it was able to float, which was a nifty feature that the Pro-Talk lacks. If you work in a tough environment and need a reasonably priced smartphone, this is a good choice. If you're just a bit clumsy, and want a more capable handset you'd be better off choosing Motorola's Defy. However, we rather like the building-site cred that the familiar JCB black and yellow body gives you.